If you start to play this movie and you are expecting it to be a serious police drama that is 100% realistic you will be in for a round of disappointment. HOWEVER, if you watch it and just go along for the ride, you'll get some laughs, some adrenaline rushes and basically be able to have something fun to talk about with your friends. I'm sure that there are some LAPD cops out there saying, "You gotta be f***ing kidding me!" and LAPD S.W.A.T. units are going to be hiding their patches for awhile to try and live down the "crazed cowboy" image this movie has painted of them. But take heart guys, I think anyone with a functioning brain will realize that the good guys are just as LARGER THAN LIFE as the bad guys are. 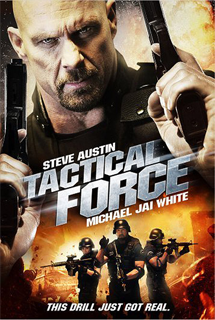 It's an action movie and to be honest, I have to say that although the characters were outrageous stereotypes; the people portraying them did an excellent job of carrying it off without making it too campy. Especially kudos to both females in this movie because they carried off their parts well without having to depend on their sexuality. It truly began to feel like a James Bond movie with the number of times that our heroes got captured and were ABOUT to be executed but somebody just had to say something before pulling the trigger. That is probably the only thing that really threw it for me. Bad guys were shooting and shooting to try and kill these cops and when they do finally get them, they TALK instead of shoot. As was said in an old classic movie, "When you're going to shoot somebody, shoot, don't talk." All in all, give this movie a watch and make sure you do it with a few friends because you'll be laughing and talking about it for long after the final credits roll. ENJOY!